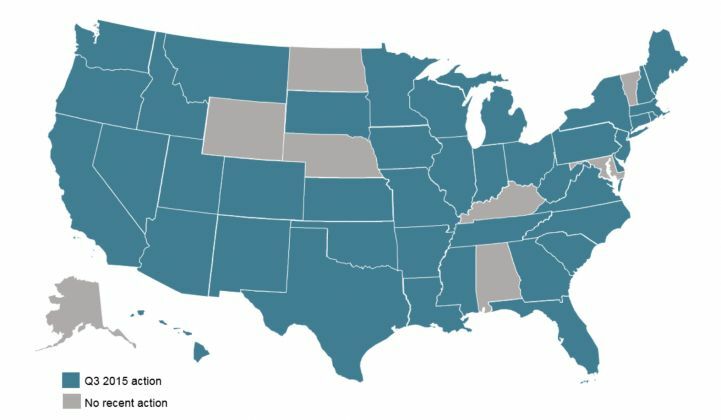 In the third quarter of 2015, there were 91 instances in 42 states of proposed or enacted solar policy changes, according to the N.C. Clean Energy Technology Center’s latest “50 States of Solar” report. The most common policy action was around net metering. Regulators or legislators in 19 states considered or decided on changes to their solar net-metering policies in the third quarter, and 12 states were conducting a solar-valuation or net-metering study. Factoring in overlap, a total of 27 states were either studying or changing their net-metering policies in Q3. Part of the reason so many states are addressing net metering is because of the solar sector's success. Due to rapid solar adoption, utilities in several states are approaching or have already hit their previously established net-metering caps, which is triggering a review of the policy. Some states are expanding the policy, while others, such as California and Nevada, are considering a successor tariff. Hawaii recently became the first state in the nation to end its solar net-metering program. In many places, the solar market has also been affected by fixed-charge increases. Last quarter, 26 utilities in 18 states had ongoing or decided rate cases in which the utility proposed to increase customers’ fixed charges by at least 10 percent. The average fixed-charge increase in these 26 instances was 70 percent. Fourteen utilities in 10 states (some of which have also proposed fixed-charge increases) had pending or decided proposals for adding new charges specifically on net-metered solar customers last quarter. That number rose from six utilities in five states in the second quarter. Many of these utilities have proposed rate structures that subject residential solar customers to demand charges, which are based on peak energy usage over a billing period. As of Q3, states with pending utility proposals for new residential demand charges include Arizona, California, Kansas, Oklahoma and Texas. “Utilities are waking up to the potential threat that distributed solar has on their existing business model,” said Inskeep. The responses to date have been varied, which has led to “a mess” of solar policies around the county. In addition to restructuring policies, some utilities are adapting by getting into the solar business. 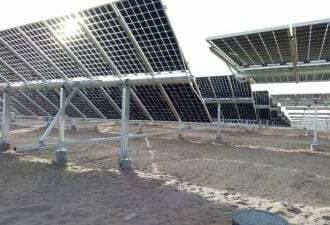 In the third quarter, utilities in Arizona, Georgia and Texas developed programs to own or operate distributed PV assets. In New York, Con Edison proposed a residential solar and storage program as one of its demonstration projects under the REV proceeding. The system would be owned and operated by Con Ed’s unregulated subsidiary. Inskeep acknowledged that it’s difficult to come up with the perfect solar policy, in part because each solar market is different and so the policies need to be localized. The concern is that with so many regulatory and legislative changes in the works, it will become increasingly difficult for potential solar customers to move forward. One of the best opportunities to support a strong solar industry into the future is to create a value-of-solar tariff or a successor tariff for net metering that fairly accounts for all of the benefits solar can provide, said Inskeep. The "50 States of Solar" report was produced in partnership with Meister Consultants Group. Subscribe to GTM Squared for regular energy policy updates from across the U.S. in our State Bulletin series.